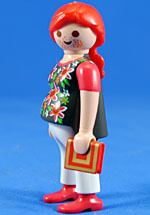 The third series of Playmobil's Fi?ures came out in the fall of 2012 but it ended up being nearly impossible to complete. After eight months of hunting various Toys R Us'es and mom'n'pop shops, I have completed the set! This third series of Girls themed figures is a noted improvement over of the first two with multiple "must haves" and I'm very pleased to see that each series has improved on what came before. For the third series, the Girls are once again packed in a pink bag with silver radials. It's a decent look but it's just too similar to the first series. Plus, it's such a light shade of pink it completely clashes next to the very dark black of the Series 3 Boys packs. It's just hard to believe that they had exhausted all possible colors in only two series. Also, as always, above the barcode on the back of the package are a series of numbers denoting production information that is almost never helpful. 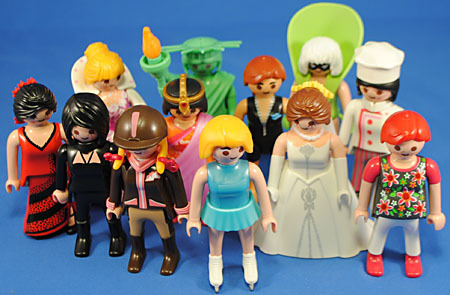 This assortment is number 5244 01 and in addition that we get strings of numbers than can sometimes help identify the figure within the blind bag. Without any further ado, though - I give you Girls Fi?ures - Series 3! Here we get yet another poofy-dress girl. It was cool in the first series but I'm getting kind of bored of it now, especially since these tend to be just generic "pretty girls" that don't fit in with any established line. This one, at least, has a bit more sense of place (hence I'm calling her the "Southern Belle") probably a result of her accessories and lack of crown. 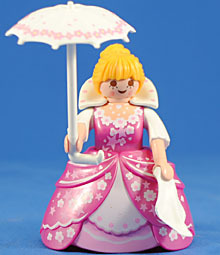 She gets a parasol which is pretty neat and a handkerchief for which she can use to proclaim her suffering of "the vapors." I was impressed and surprised that she also came with a gold necklace (which I forget to photograph) as an unsolicited alternative to the big collar (she's also supposed to be wearing some yellowish thing in her hair which I accidentally put on the bride when photographing). While I wasn't originally sure what to do with her it suddenly occurs to me that she'd make a great "fancy lady" stopping over in my future Western town - nice! Oh ho ho, how I've been waiting for this figure! I'm so, so excited to have been able to score not only one but two of her! By far the rarest of the series, for obvious reasons, I lucked out on a fresh case recently at a TRU allowing me to finish of the collection. 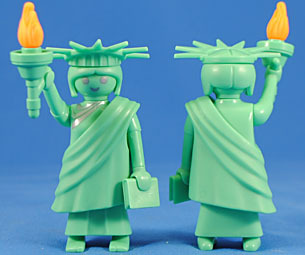 It was the revelation of this Klicky at Toy Fair 2012 that made me decide to collect Statue of Liberty toys (especially since Lego did one in their Collectible Mini-Figure line). This figure is gorgeous! Cast in a nice, soft green set gets a book and toga along with a new crown piece and torch handle to complete the iconic look of America's most famous statue. If you can find her, get her - this is everything that these lines should be - iconic and fun! I'm really pleased with this figure. 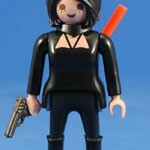 This is exactly what I want from Playmobil - realistically plausible with a hint of stylized fun! The surfboard is cast in in a nice light green and has a great sea pattern on it. 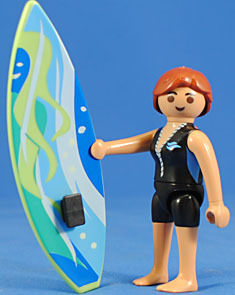 The woman is given a very well executed "spring suit" wet suit which looks great and makes perfect sense. If I had to nitpick I would mention that the eyebrows are a bit odd in how conspicuous they are. Regardless, this is simply a flawless execution of of an idea. If only every Fi?ures Klicky was this good we'd have such an incredible line of toys that could easily draw in many new shoppers and potential fans. 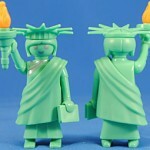 Like many figures in this series, this Klicky almost identically duplicates a mini-figure Lego already did in their CMF line, so big points on originality there Playmobil. Regardless, this is a fun figure and another great example of the value and importance of a "potpourri" line like this - a very familiar look that fits in with multiple themes while not necessarily being strong enough to work in a proper set. She comes with a fan and a bit of red flowers/ribbon for her hair. 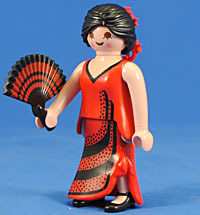 The dress also has a great black fringe print to complete the look of the popular spanish dancer. 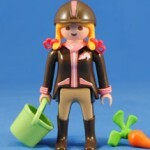 Girls love horses and Playmobil loves pushing its new line so we get another figure of a rider, though this one is a bit more casual. While I have little-to-no interest in the Equine Arts I think this figure was pulled off well. I like the complementary shades of brown with the white and pink accents, plus the pulled-down pink hoodie adds a lot of personality and realism for me. 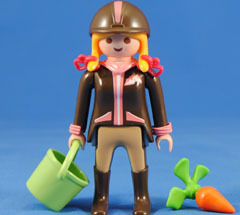 Best of all we get some accessories - particularly the (oversized) carrot. This Klicky ends up being one of the more memorable entries in this series and a good figure despite being from a theme I'm not that into. 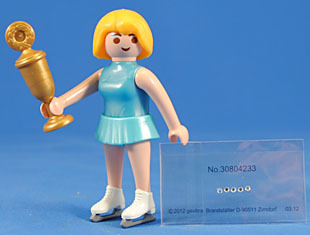 This figure feels a lot like the Ballerina from the last series but I think it's the near identicalness to the Lego CMF one that's throwing me. She's built off of the swimsuit body type with a miniskirt from the cheerleader (I believe) recast in a pearlescent blue to match her leotard and legs with ice skates sculpted on. She even gets a big gold trophy to prove she's the best. Once again this female Klicky gets big, thick eyebrows which are just distracting to me - the less facial feature the better with this aesthetic, I think. She is certainly a good looking figure and a unique entry into the line, but her similarities to the Lego end up making the figure feel stale to me. Now this is one came out of left field but is a fantastic addition! 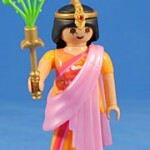 She is a Hindu princess it seems, which is, I believe, Playmobil's first foray into that culture and I'm very happy to see them continuing to be more globally inclusive. 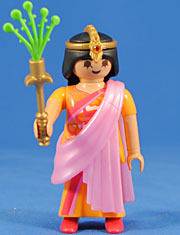 She comes with a nice crown and the same scepter-like accessory we saw with Cleopatra in the last series now with a small branch or sprig of leaves. Under her pink toga is a beautifully elaborate printed pattern very reminiscent of the designs seen on Indian dress. She too has eyebrows and eyelashes printed on her face along with the bindi dot between her eyes - a great touch of authenticity. I really dig this figure and hope to see much more of this kind of thing in the future. I'm far, far more interested in seeing the planets many cultures be represent than get yet more and more Knights and Jockeys. Boom - we're done. 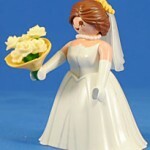 Check "Bride" off the list because it is inconceivable that there is any way Playmobil could improve upon this figure. This is a perfect use of the gown add-on with a beautiful and subtle silver print to add detail and accentuate the dress. She gets an excellently done, semi-translucent white veil which plugs into the back of her hair. It even has a peghole on it adding additional bits of accoutrements (which I learned by accident when attaching the Princess' flowers to it). She gets a necklace and a fantastic bouquet of off-white roses. This is really a gorgeous figure and despite me only collecting the "historical" themes and this becoming decidedly modern I deem this a Must-Have! Oh man... and you thought the Lara Croft was none-too-subtle. 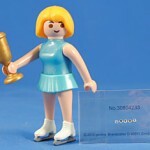 I admire Playmobil greatly for having never fallen prey to the licensing game, at least with major motion pictures, and this passes novelty into sorrow for me. 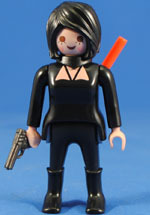 And of all the things to rip-off.... Aeon Flux...? The live-action movie version!? Germans, man... am I right? This is a boring figure, lacking originality and anything that makes it stand out in its own right. You can't even pretend she's a spy or something because of the signature chest pattern from the film. Beyond its litigious nature the only thing of note here is that she has an all new torso with a System-X like hole in her back into which fits a plug with a peg on it upon which the baton holder hangs. It's actually a cool too and a nice alternative to the sash and I hope to see this feature migrate over to the male torso too. And the pop culture references just keep rolling with Lady Gaga. I'm sure it's not a replica of one of her costumes but she is exactly who the entirety of this figure calls to mind (were it not for the white hair and bare legs this might feel like more of a Karen O figure). She gets an all new mega-collar piece, which is neat but I can't foresee much reuse for it. 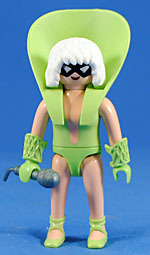 I also have to say the lime green color white hair is just... boring if not mildly repellant, for lack of a better word. She gets a microphone and sports some of the more elaborate wrist guards from Knights, which I think is actually kinda cool if only they weren't so loose on her skinny, bare arms. This certainly a unique figure, but I am pressed to recommend it beyond that. Pregmobil!!! 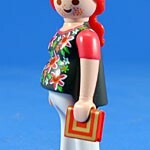 After almost four decades Playmobil has introduced their first, proper pregnant body. At first I this was just a new torso with a large belly, but indeed the legs have a thicker waist to complement and complete the look - nice! The outfit is a bit bland, despite a great and elaborate flower print, but somehow it feels pretty accurate for maternity clothes. 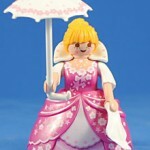 She comes with a book (with a sticker you have to apply for the "cover") to help plus her up. To be honest, the figure is a the most underwhelming in the line as she seems the most plane, but I can't really imagine what they could have done differently. Still, though, the new body is a very welcome addition to the Playmo-verse and as such she is quite recommended! We had a Pizza Chef in the first series of Boys Fi?ures and he was fairly disappointing but this figure picks up that baton and makes leaps and bounds in improvements. There is, of course, the traditional and iconic hat, but its the white jacket and grey pants that really sell this Klicky as a proper chef while the red and pink highlight help infer her Baker-ness, confirmed by her accessories. She gets a big platter upon which you can rest a cake. The cake is a simple, hollow piece (I thought it was her hat at first) with three pegholes along the sides and one on top. These fit any standard hair-accessory which means you can totally customize with different bows and blossoms as you'd like (pearlescent pink bows are included). 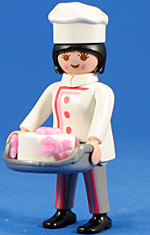 While I would have preferred a more generic chef (i.e. less pink on the outfit) this is a fantastic addition and will fit in perfectly to any of your modern day themes/collections. 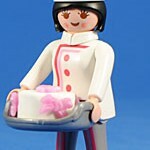 This entry was posted in blog exclusive review, Playmobil. Bookmark the permalink. Loved them all, especially pregnant women. You Could provide individual picture of her in a higher resolution? Sadly the format doesn't allow larger sized photos, sorry. Glad you like the FI?URES too though!